The Government of Indonesia sees the integration of cattle with oil palm and crops as a means for increasing the cattle population and beef production in Indonesia. In response, two projects have been developed to strengthen Indonesia’s community-based beef sector and to improve the livelihoods of smallholder cattle producers. These projects will be managed under the IndoBeef research program, which is a collaborative effort involving IAARD and ACIAR. 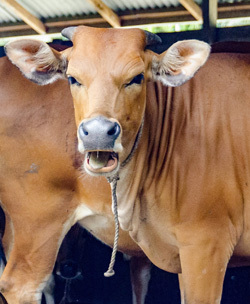 ‘Improving cattle production and quality in crop-based farming systems’ – CropCow or sapi-sawah. The IndoBeef research program was launched in January, 2018, and is due for completion in June, 2021. Rapid income and population growth, and urbanisation have increased demand for beef, but domestic production of beef cattle has not increased sufficiently to match this consumer demand. Difficulties relating to availability of land for growing cattle and access to economically viable feed, effective reproduction processes, efficiencies of scale and access to markets are all part of this beef supply conundrum. Indonesia’s 11 million ha of oil palm plantations has been identified as an area with high abundance of biomass for feed, with potential for integration with beef cattle. Both industry and government have developed programs to support the introduction of cattle into palm plantations and policies to promote cow and calf production in Indonesia. However, neither the necessary scale of palm-cattle integration nor the increased cattle flows from smallholders have been achieved. providing a strategy for scaling out palm-cattle integration. Professor John Ackerman (UNE), Dr Yeni Widiawati (IRIAP) and Professor Tjeppy Soedjana (Project Mentor). Market chains: A/Professor Christie Chang (UNE) and Dr Trie I.G.A.P Mahendri (ICARD). Animal and palm production: Dr Fran Cowley (UNE); Dr Dwi Yulistiani (IRIAP; animal production); Dr Neneng L Nurida (ICALRRD; soil compaction) and Professor Deciyanto Soetopo (ICERD; palm production). Socio-economics: Professor Rene Villano (UNE) and Dr Suci Wulandari (ICERD). Farm adoption and scaling out: A/Professor Julian Prior (UNE). NT DPI: The Northern Territory Department of Primary Industries are providing research into tropical cattle production, feed budgeting and pasture improvement. ICARD: The Indonesian Center for Animal Research and Development is the main animal research institution in Indonesia. IRIAP: The Indonesian Research Institute for Animal Production carries out many research programs on poultry, dairy cattle and goat, beef cattle, buffalo and sheep. IVETRI: The Indonesian Veterinary Research Institutes are focused on program formulation and research evaluation and implementation of veterinary research. ICASEPS: The Indonesian Center for Agricultural Socio Economic and Policy Studies undertakes implementation, technical and public consultation, policy analysis, evaluation and reporting on socio-economic and agricultural programs. ICERD: The Indonesian Center for Estate Crop Research and Development is important for the development of Indonesian agribusiness. ICALRRD: The Indonesian Center for Agricultural Land Resources Research and Development is focused on program formulation and evaluation of agricultural land resources research and development. BPTP: The Balai Pengkajian Teknologi Pertanian is one of the technical implementation units of the Indonesian Agency for Agricultural Research and Development of the Ministry of Agriculture. Dinas Peternakan, Dinas Pertanian and Dinas Perkebunan: These organisations are the main government technical support agencies for livestock, agriculture and estate crops, respectively. They will form an important component of future extension of the technologies and business models developed from this project. In Nusa Tenggara Barat, previous ACIAR-funded research has shown that cattle numbers, beef production and returns to smallholder producers can be increased by integrating improved husbandry and feeding practices into the annual cropping of rice, corn and other crops and the feeding of forage tree legumes. There has been some scaling out of these practices and new business models are developing. However scoping studies for IndoBeef identified constraints that require further investigation. As well, further research is required on how to increase adoption of proven practices and on the best approaches for scaling out. In Kalimantan Selatan the priorities are more basic: to investigate production and marketing constraints of an emerging smallholder sector. determine how to increase adoption and scaling out of proven interventions that improve household livelihoods. Professor Heather Burrow (UNE), Dr Yenny Nur Anggraeny (BCRI) and Professor Budi Haryanto (Project Mentor). Market chains: A/Professor Christie Chang (UNE); Dr Tanda Panjaitan (BPTP NTB) and Dr Hermansyah (UNRAM). Animal and palm production: Dr Fran Cowley (UNE) and Dr Yenny Nur Anggraeny (BCRI). Socio-economics: Professor Rene Villano (UNE) and Dr Taqiuddin (UNRAM). Farm adoption and scaling out: A/Professor Julian Prior (UNE); Professor Dahlanuddin (UNRAM) and Dr Tanda Panjaitan (BPTP NTB). IAARD: The Indonesian Agency for Agricultural Research and Development is the research arm of the Indonesian Ministry of Agriculture, and includes 11 research and development centres across a range of agricultural and horticultural categories. Lolitsapi: Loka Penelitian Sapi Potong is ICARD’s Beef Cattle Research Station (BCRI) at Grati, Pasuruan, East Java. It is responsible for a range of beef cattle research activities. Dinas PKH: Dinas Peternakan dan Kesehatan Hewan works closely with UNRAM and BPTP to develop policy and programs on beef cattle production, and supports a range of activities to improve beef cattle trade and processing. BPTU-HPT: Balai Pembibitan Ternak Unggul dan Hijauan Pakan Ternak Pelaihari is the Centre of Excellence for Livestock Breeding and Forages, near Pelaihari, KalSel. Balittra: Balai Penelitian Pertanian Lahan Rawa (Balittra): Balittra is the Swampy Land Agricultural Research Institute in Banjarbaru, KalSel. Dinas: Includes the livestock department (Dinas Peternakan), the crops and horticulture department (Dinas Tanaman Pangan dan Hortikultura, Dinas TPH) and the department of extension (Dinas Penyuluhan). ULM: Lambung Mangkurat University is a public university in Banjarbaru, KalSel, established in 1958. UNRAM: University of Mataram in Lombok, NTB, has a long and successful history of collaboration with ACIAR projects, leads the Research Consortium for Large Ruminants and has a strong scientific track record in cattle production, forage research and socioeconomics. IndoBeef is a key component of UNE’s Indonesian research initiative, which involves establishing links with Indonesian universities that have a strong focus on agriculture, and providing opportunities for Indonesian students to complete higher degree research relevant to the IndoBeef program. Currently, five Indonesian doctoral candidates are completing research at UNE of direct relevance to IndoBeef.